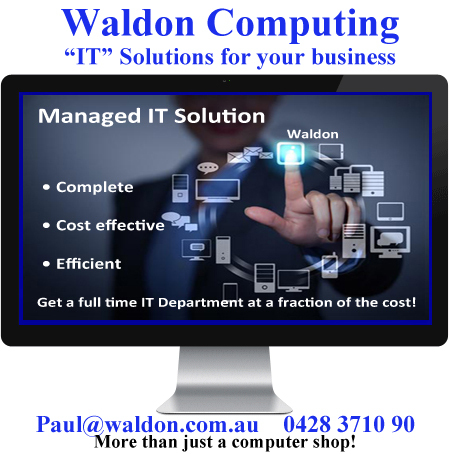 Here at Waldon – we offer the service of REMOTE ASSISTANCE. As long as you have a working broadband internet connection and have a problem – We can help you!! Click on the link below. Once you request assistance it will transfer you to our own secure server – where you will download and run a very small program, and will then notify us of your assistance request. Once we respond to the request, we will ask to take over your computer to fix your problem. At any stage you can take over/stop the remote control. All requests can only be used once and have a time limit for security. Please notify us first by either email or phone to organise a suitable time to work on your computer. We CANNOT start the assistance without your personal request. If you feel uncomfortable with the idea of using the internet for assistance – we would be more than happy to organise an On-Site visit.